Two 60 lb. sandbags (not included) are recommended to increase stability if displayed outdoors. You can purchase sandbags at your local hardware store. The sandbags are inserted in base. A collaborative work of more than 30 artists, with and without disabilities, this piece has over 200 unique sets of eyes in different sizes, shapes and colors, over a light blue background. The contrast between the light blue background and the bold colors of the eyes makes the sculpture vibrant and whimsical. This work captures the onlooker’s attention no matter where you look giving each viewer a splendid “eye full” of color and fun. 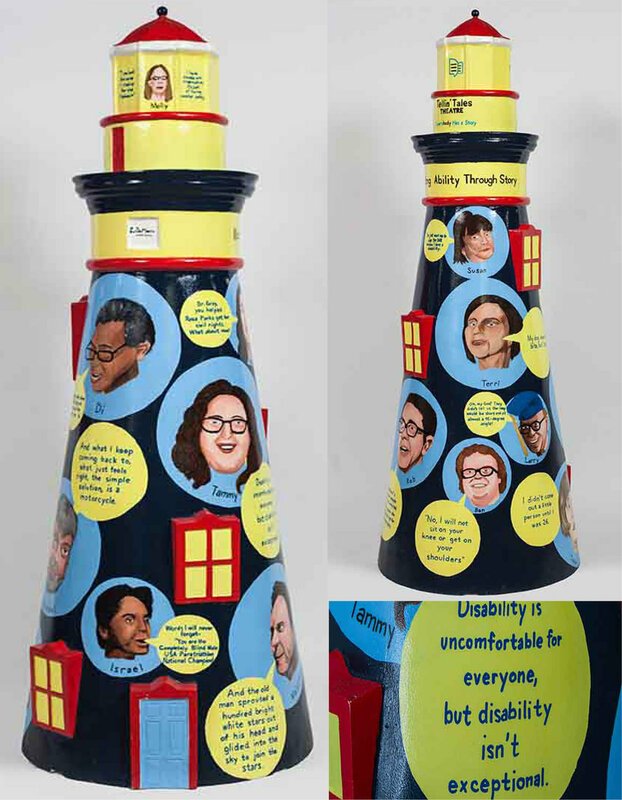 This colorful lighthouse represents access and inclusion for people with disabilities. Through its unique representation of the help received by The Chicago Lighthouse, with its location, Roosevelt and Wood, painted on the sculpture, this artwork is the perfect symbol of hope and acceptance. 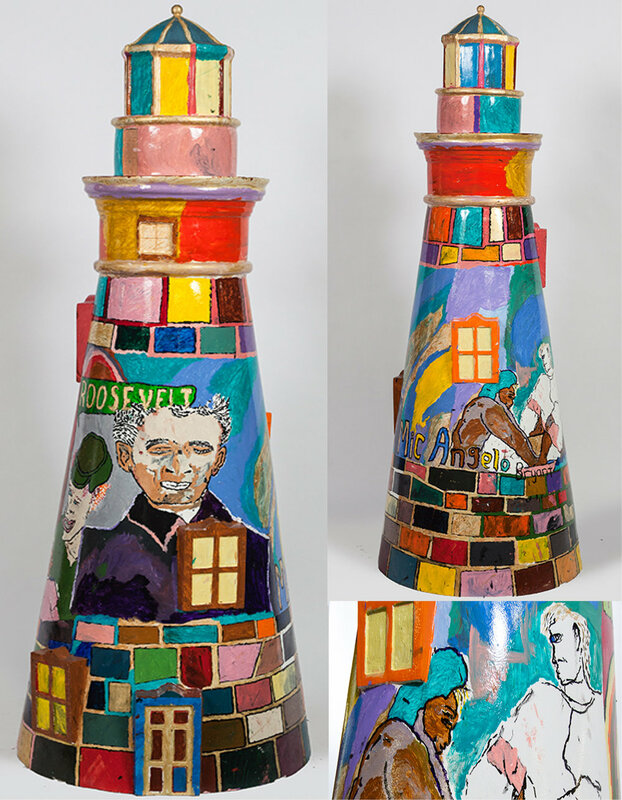 With the multicolored bricks interlaced up the piece and the portrait of Louis Braille, this work embodies the value of would be best in a home or office that truly believes in the mission of The Chicago Lighthouse. Artist Matthew Kopp, of Tellin’ Tales Theater, the only disability-run theatre company in the Chicagoland area, worked on this piece in collaboration with Louis DeMarco of Project Onward, a nonprofit studio and gallery for professional artists with mental and developmental disabilities. Their vibrant and thought-provoking piece shines a light on the personal stories of individuals with disabilities who are making our community a better place every day. Artist Kyle Langer created this lighthouse to visualize the feeling of living with depression and anxiety disorders, while offering empathy and encouragement to viewers who have faced struggles of their own. Its bold colors and encouraging message make this sculpture the perfect addition to a home, garden, health center, or gallery space. This modern, inspirational piece is a true focal point of access and inclusion. 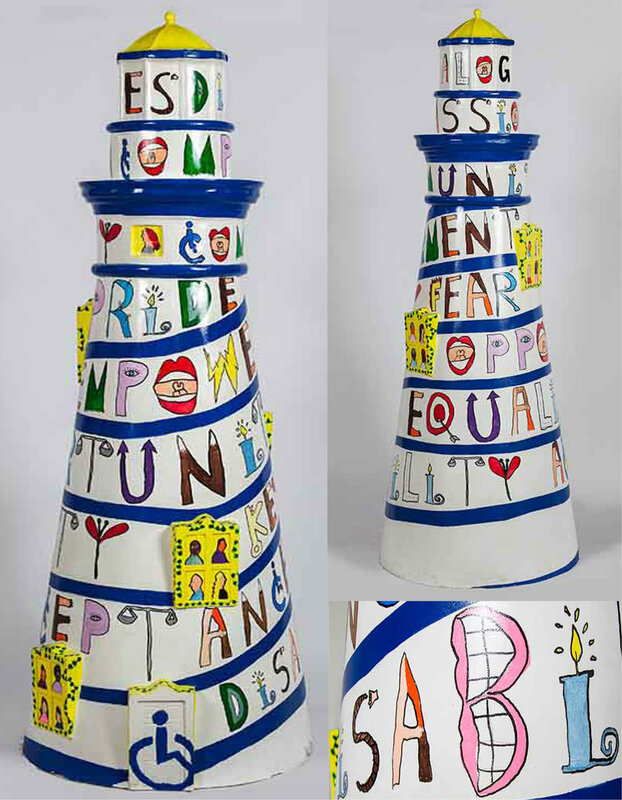 Artist William Douglas from Project Onward, a nonprofit studio and gallery for professional artists with mental and developmental disabilities, created unique lettering that wraps around the lighthouse bringing to life empowering words of inspiration and equality. This exceptional sculpture showcases a stark white background with bursts of yellow beginning at the base and working its way to the top with inspiring messages looping around the lighthouse.